Many consider wildflowers to be the most exciting and rewarding of all flowers. This popular and interesting wildflower gets its name from a sticky fluid on the leaves that flies, gnats, and mosquitoes get entangled in. 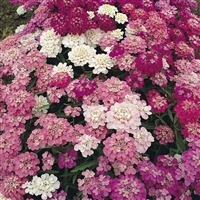 The brilliantly pink flowers are grown in profuse quantities in 2-3 inch (5-7.5 cm) clusters. Plants are popular in beds, and natural settings because of the length of their flower season. Biennial for partial sun. Easy to grow plants bear several stately and beautiful flower spikes atop leafy stems. Individual blossoms are speckle-throated, thimble shaped in soft colors of cream, white, pink, carmine, and purple. They are striking planted singly or in groups. Blooms summer-fall. Also ideal in mature settings. Dramatic for flower arrangements. Non-genetically engineered seeds. Culture: Warm regions sow in fall, cool regions sow in spring, outdoors in partial shade. Use rich, moist soil with lots of humus. May need staking. Perennial for sun. Beautiful double flowers of white, yellow, pink, red, and maroon stemming from soaring verticals to 7" (17.5 cm.) tall studded all summer with large, pretty, open-faced flowers that have crinkly petals. The blossom opens from the bottom. Most desirable for tall background or along fences. Non-genetically engineered seeds. Culture: In fall, sow seeds in well-drained, rich, moist soil, or sow seed indoors. Transplant in early spring when 3" (7.5 cm.) high. Annual for full sun. Beautiful 8"-10" (20-25 cm.) velvety crimson blooms on 5'-8' (150-240 cm.) stems. Non-genetically engineered seeds. Culture: Easy to grow; plants thrive even in poor soil with moderate moisture. Sow seed after all danger of frost has passed in a sunny area. Deadheading spent blooms prolongs blooming season. Flowers are excellent for cutting. Boil stems 1 1/2 minutes for lasting arrangements. Perennial for full or partial sun. Early prolific flowering lupines are one of the most attractive and colorful garden flowers. Produces flower stems in shades of blue, pink, salmon, white, and yellow. Plants may need staking. The deeply cut palmate leaves are very attractive on their own. Non-genetically engineered seeds. Culture: Soak seeds for 24 hours before planting. If sown early April in a cold frame, this variety may flower 4 months later and may remain in the garden as long as a perennial. Direct seeding from July-September have to overwinter and will flower the following June. Self sows. Outstanding in mixed beds, when massed by themselves or for backgrounds. Excellent for cutting. Many consider wildflowers to be the most exciting and rewarding of all flowers. This tall, sturdy, dramatic plant produces attractive 1"-2" (2.5-5cm) bright yellow cup shaped blossoms. Flowers open wide at twilight or on cloudy days. These hardy, long blooming plants prefer full sun and well drained dry soil. Culture: Start plants indoors 6-8 weeks before transplant time for your area. Or sow seeds outdoors in spring after all danger of frost has passed. Care: Water regularly and fertilize monthly. Protect young seedlings from snails and slugs by baiting. A flower that attracts butterflies. 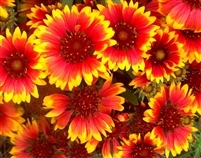 2"(5cm) blooms of bright, showy, yellow tipped red, daisy faced flowers show above foliage of 14"-24" (35-60cm). Culture: Sow seeds in spring, full sun area. Prefers well drained, ordinary soil, but is versatile. Tolerates drought and heat well. This variety is improved for uniform plant habit and for lasting. Blooms through mid-summer.